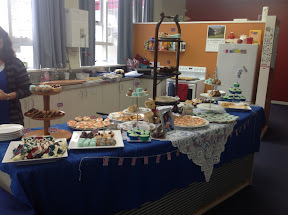 We had a morning tea at work with the theme “Royal Baby Shower” and I made this Red and Blue Velvet Union Jack Cake. 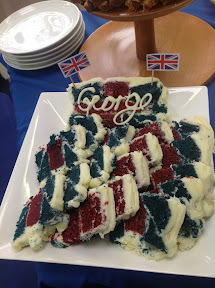 The slice with “George” on it shows that as it is cut, it created massive Union Jack flag shapes. 1. Preheat oven to 180 degrees C. Line a loaf tin and a shallow cake tin with baking paper. 2. In a large bowl, cream the butter and the sugar. Add eggs one at a time, beating well after each addition. Sift cocoa and add to mixture. 3. Add flour alternately with buttermilk. Add vanilla and salt. 4. Separate the batter into 2 bowls. Colour each batter. 5. Mix the bicarb with the vinegar, and gently stir 1/2 into both of the mixtures. Be careful not to over mix. 5. Divide batter into prepared tins. 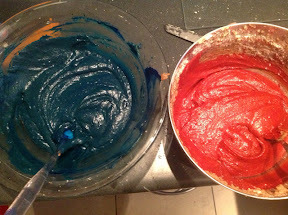 The blue goes in the loaf tin, and will take an extra 10 min to cook (approx), the red goes in the shallow pan. Bake in preheated oven for 35-40 minutes. Allow to cool. 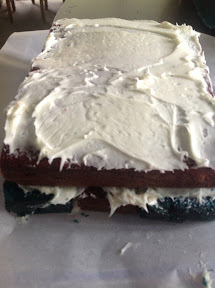 Slice the red cake into a large rectangle the size of the final cake, and 2 thin strips. 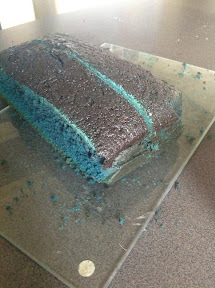 Place a thin red cake with blue either side. Carefully cut the blue sections on an angle. 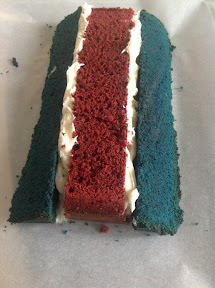 Get crazy with the icing, icing between the blue and red stripes. This is enough to do your head in. Lay the large red cake on top. Ice. 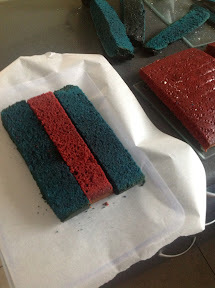 Lay the thin red cake, and 2 blue sections, slicing the blue on an angle. Ice everything, turning yourself a little mad in the process.